Australian Migration Law comes from the Migration Act 1958, Migration Regulations 1994, a Department of Immigration & Citizenship Procedures Advice Manual, and endless Ministerial Directions and Parliamentary Gazette Notices. It also changes and is updated constantly. Basically (under s65 of The Act), if a visa application meets the Regulations in the legislation as interpreted by Departmental Policy, they will grant an application, ie. Get it right…..you get a visa! But if the application does not meet the criteria, the visa will not be granted. This is the case with all visas, and very much the case with tourist visas! There is no room for error, and it the application fails, you may experience re-application delays or you may very well not get a second chance. If it’s wrong even in a small way, you get nothing! If the outcome of your Australian Visa application and your future plans mean something to you, you should use a professional who knows all about the legislation, and how the Department views visa applications. We will assess your particular case and give you the correct visa requirements for your specific situation. Why would you settle for anything less? Isn’t your future happiness and security worth doing it right? And beware of fake and unregistered agents, especially in the Philippines! 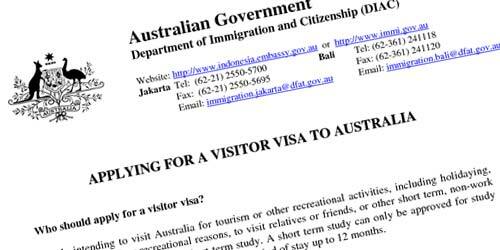 Beware of opportunistic travel agents, employment agents or education agents who claim they can manage your visa application for you. You have no proof of their qualifications or ethics, and therefore no protection whatsoever! Insist on a MARA-registered migration agent! See this YouTube VIDEO to learn about the risks! Read our FREQUENTLY ASKED QUESTIONS (FAQ) page HERE! Take a free (and QUICK!) online visa eligibility assessment now, and let us see what how we can help you achieve your dream of a new life.